A North Carolina mother has thanked Jesus for performing a “miracle” after a good samaritan saved her infant daughter from choking this past Thanksgiving. 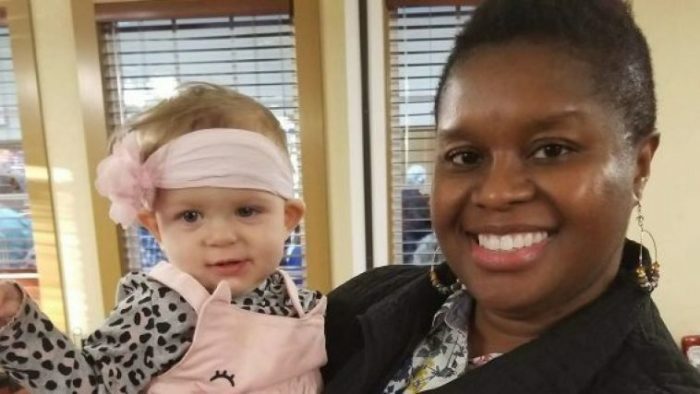 Hannah Marie Jarvis was enjoying the holiday with her family at a Golden Corral restaurant when her 7-month-old baby, Calli, started to choke on some mashed potatoes. Hearing the commotion, a waitress came over and yelled out, asking if anyone could help the family. Mother-of-five Deborah Rouse, who was dining at the restaurant, quickly began performing the Heimlich maneuver on the infant. Overjoyed, Jarvis said she and her family hugged Rouse at the restaurant. Jarvis said Calli was evaluated at the hospital after the incident and is doing well. According to the Department of Health, choking is the fourth leading cause of unintentional death in children under the age of 5. At least one child dies from choking on food every five days in the U.S., and more than 12,000 children are taken to a hospital emergency room each year for food-choking injuries. In 2016, police officer Kenneth Knox said he was “guided by God” after performing CPR on a 2-month-old infant who had choked on cereal, saving the baby’s life. Knox, a devout Christian, was later asked by the little girl’s parents to be her godfather: “Out of my 25 years being a cop this is my greatest and most profound accomplishment and it made every second of those 25 years worth it all,” he said. What Did Jesus Say About Children?